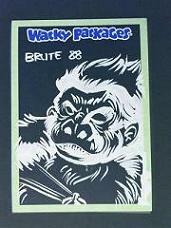 This appears to be a proof or pre production UK Wacky Packages Box. It has a yellow color and is missing the coloring and letters of Ajerx on the front. The box color should be orange. It has never been folded. The number on this box is 1-459-40-01-4, as in original box. Unfortunately, it has crease(large) and smaller creases. Has anyone ever seen one like this before? I would like information on this as I have never seen another one. On LostWackys.com is where there is an image of an original box. I have a nearly perfect one of these. They came from an uncut sheet of boxes that were cut up and pieced out. I always refer to them as "in process" boxes. I know of a collector and a dealer who both came upon many series uncut box sheets. Where did you get your uk box shown here? One of the only stories I recall was that, when many of these were first found, a good deal of them had "bird crap on them". I'd say it's possible that these all came from the same original source - but I don't know what that was, or I don't recall at the moment. 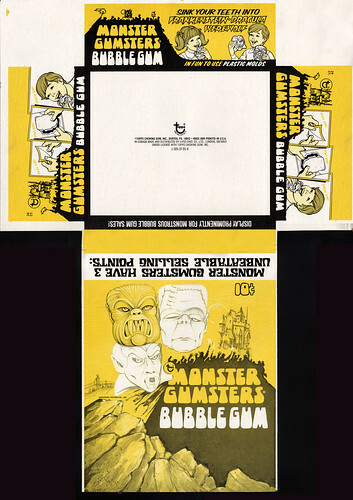 Here are a few pieces of mine that came from that source, not the "Monster Gumsters" only includes the Y and K plates. Did you used to sell Wacky Stuff on Ebay? I got this box flat on Ebay from a seller in New Jersey in late 2003. I appreciate very much the information you gave. I had never heard that before. I had this for all this time and knew nothing about it. That is some great stuff. Love those flat boxes/pre production/in process. Topps Vault sold alot of obscure and common ones, as I remember. 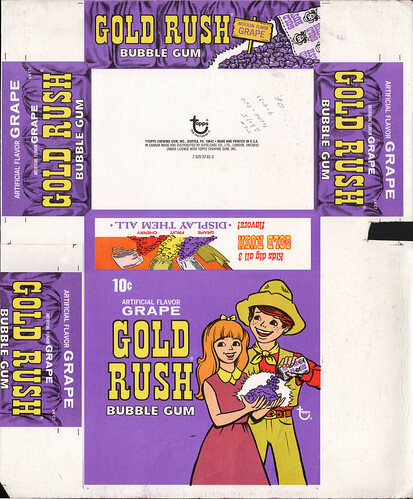 I especially love the GRAPE GOLD RUSH. Used to buy Gold Rush as a kid in the 1970's. Thanks for the images. I sell stuff on ebay and privately, have done so for over a decade. I live in NJ so quite possible you bought your box from me but 2003 seems early, I am not sure I had my box by the but time does fly so my date recollection could be wrong. I am certain I would have advertised that the box came from an uncut sheet so the fact you seem unaware of your box's original leads me to believe you might have gotten it from somewhere else or you possible forgot the details from the auction. Of all of the boxes I had from uncut sheets, the UK was by far the most scarce and I personally think it is one of the coolest so you have a cool item there! Again, thanks for the information. I am not sure how you got to be a fan of Wacky Packs. When I was in Elementary School from 1972-1975, somewhere in those years, a bunch of kids had them at school. This is where I got hooked. This was down in Miami, Florida. I lived across from the school and this was behind a strip mall with an Eckerd Drugs, and they sold them there. I didn't have any money but my father would occasionally let me buy one. He was nice enough to pay. After this, my interest totally died away as I went onto college and beyond. However, I never got rid of them. I also got my brother's. I kept them as I moved around. 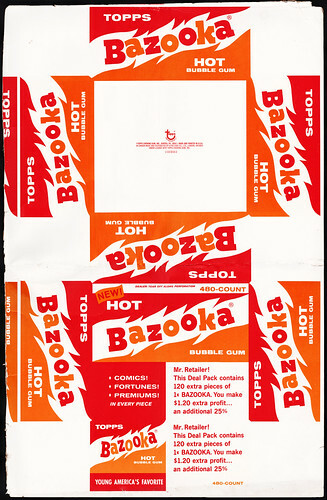 Then ebay came around and I got a copy of the Wacky Packages Gallery. I got hooked again. Here I am. As I grow older, I have become more curious as to how other people have gotten hooked. Absolutely no one else I have run across in my years who I have met or work with, ever got immersed in them. I collected them as a kid in 1973 with kids in my neighborhood. We would go on bike rides to a small mom and pop store about a mile away to get packs. I would have to choose between getting packs of wackys or icecream, wackys woud win that battle with ease. Found my stash of wackys in 1996 and have been going strong ever since! Ya, the good old days. Our Mom's would give us $.15 to go shopping with. When I started collecting Baseball cards I think they were $.15 per pack. That was always a struggle to figure out how many packs I could buy for a buck....Oh, the good old days! I don't recall ever having $1 to spend at once when buying wackys. It was a quarter at a time, 5 packs of REAL gold! You should have seen the look on the clerk's face when each kid did the same thing.... After a while he got used to us doing it, and just started ringing them up as two separate purchases...too funny! A dollar was pretty rare, generally a birthday card from Grandma to get that kind of cash. I didn't start collecting BB cards until around 1976 and I think they were $.10 or $.15 per pack. I remember being about 11 or 12 when they went to $.15 per pack and you no longer could buy an even number for a buck. You always got change back to buy some candy. I remember spending many after school afternoons pulling our wagon through the streets of Dayton Ohio collecting returnable bottles to fund my Wacky Package and candy habits. Me: "Hey Mom, I'll be home in 3 or 4 hours before dinner." Me: "Through the alleys looking for bottles." That reminds me, we did the same thing except our focus was the bar at the top of our street. They would put the bottles out in the wee hours of the morning and it was a race between me and my next door neighbor to claim boxes of empty beer bottles, whiskey bottles, you name it. Was totally disgusting and makes me wretch a bit thinking about it as the boxes were filled with tobacco leftovers which stunk something awful! It seemed to me we would load the back of our station wagon from top to bottom and barely get a few bucks from recycling as they weighed your stash. In 1976, I remember baseball card packs were 10 cents, I would buy 10 at a time. They sold them even at the Flagami Baseball Field I used to play at off 40th street. Right next to a Gun Range. That was some of the best times. The music was great with Boston and Doobie Brothers. ROCKY was coming out at the theatres. I think Star Wars and Saturday Night Fever was still off by about a year. Used to get into the $1 movies. Single or 2 screen theatres were all over South Miami. South Miami was empty then, it is now beyond congested. Soon I would go to my first rock concert:JETHRO TULL and UK opening up. In 1976, I remember baseball card packs were 10 cents, I would buy 10 at a time. Actually you're both right. BB Cards went to 15 cents during the 1974 run. '74 wax boxes can be found with both the 10 and 15 cent prices. But in 1976, they test marketed 10-cent packs with fewer cards, so while every 1975 pack was 15 cents, there were '76 packs in both the 10 and 15-cent formats. Funny, but only having a quarter is my recollection as well. Having a whole buck would have blown me away with all the packs I could have bought.